These pins can be pieced together to form a map of Ireland. 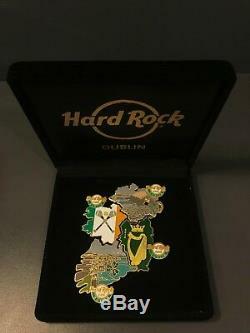 The pins come in a box with HRC Dublin printed on it. Very rare and produced in limited quanitites (300). The natural beauty of the Emerald Isle can be seen through the pins, which feature the Cliffs of Moher in County Clare and the Giants Causeway in County Antrim. The Celtic Harp and the Hurl (name of the bat used in the Irish game of Hurling) are also featured. Will be mailed from Dublin, Ireland. 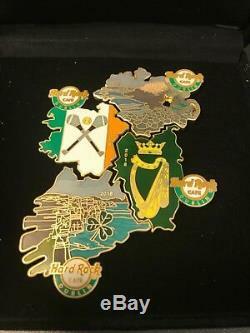 The item "LE 300 2018 Map of Ireland Set of 4 Hard Rock Cafe Pin Dublin Exclusive RARE" is in sale since Friday, October 19, 2018. This item is in the category "Collectibles\Advertising\Restaurants & Fast Food\Hard Rock Café". The seller is "nickloh2010" and is located in Dublin. This item can be shipped worldwide.